Dolly Disco from The Volante on Vimeo. Members of the Vermillion community spent the night roller-skating to Dolly Parton music in support of child literacy. The night included roller skates, snacks, a photo booth, karaoke and, of course, Dolly Parton music. Imagination Library is a national organization that provides books for children under the age of five each month. Started by singer Dolly Parton, families can register for books through the United Way of Vermillion website or at the public library in Vermillion. 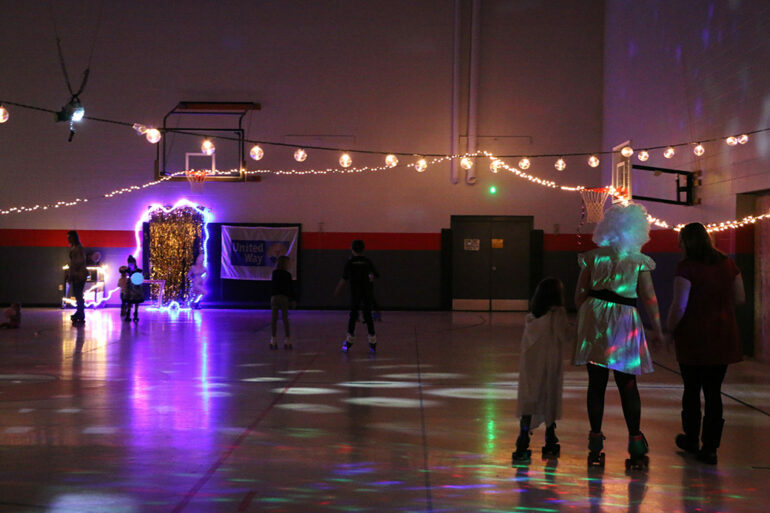 This is the third year that the disco has been held, Kelsey Collier-Wise, executive director of the United Way of Vermillion, said. “It’s a time of year where people are stuck inside, so it’s something really fun and active for people to do,” she said. Bekki Enquist-Schroeder, the event organizer, said she and Collier-Wise came up with the idea for Dolly Disco three years ago because of their love for Dolly Parton. They wanted to find a way to both support the Imagination Library and celebrate the singer. In addition to hosting the annual event, United Way of Vermillion accepted donations on its Facebook page for Imagination Library. Collier-Wise said more than $1,000 has been raised so far this year. “We are really excited to have that to start the event,” she said.